The work and a home life balance has been a challenge for workers for many years. Now with technology always keeping you connected to your work email and computer files, the line separating work and rest has become increasingly blurred. In a recent article in the New Yorker, James Surowiecki talks about a generational shift in the hours people work for those at the top and the bottom of the earning scale. Thirty years ago, the top earning workers in the United States worked less hours than the lower paid employees. Now , the best paid workers tend to work twice as long as low-paid workers. In addition, this trend seems to be increasing. A 2008 Harvard Business School survey found that 94% of professionals worked 50 or more hours a week, and almost half worked an excess of 65 hours a week. In conclusion, overworking has become a symbol of prosperity. 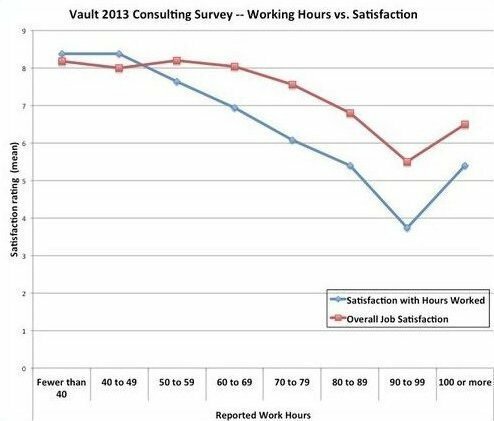 Even though this trend seems to be taking off quickly, most people would argue that working long hours makes a happier employee. In fact, it is the opposite: after working 80 hours a week, there is a steep drop in overall worker satisfaction. As a result of working long hours, most professionals don’t sleep much. The lack of sleep and resting can have a negative effect on one’s overall health and brain. The brain repairs and “eliminates waste” the most during sleep. Research states a brain that is unable to “clear” itself is at risk of the key neurons becoming degenerated that are involved in alertness and cortical functioning. Not being able to clear itself can also cause the brain to have an excess buildup of proteins that are associated with aging and neural degeneration. The damage of these neurons and protein build-up is associated with dementia and Alzheimer’s disease. The need to find a line between our working and non-working lives has never been more evident. It has become such a problem that some firms and businesses are banning working on weekends. Adopting rules like this can make a huge difference in the lives of their employees. In order for businesses and law firms to survive and make a profit, they must promote strong work-life balance policies and make it a part of the firm’s culture.